The first time I went to San Francisco was 1979 with my friend Pat as she attended the annual meeting of the National Trust for Historic Preservation. While she attended meetings, I rented a car and drove to Merced, in the central valley, to see an actual historic site, my grandmother. This one wasn’t standard fare in the grandparent department, at least to my way of thinking. As a child, she'd moved with her family to Oklahoma before it became a state. She’d lived in the Far East. She was a successful businesswoman and an avid Christian Scientist. She had a waterbed. She outlived three husbands--though at that point she was still on her second, a pigeon fancier. While I can't say that I actually loved her, she was at least as interesting as a convention of preservationists. 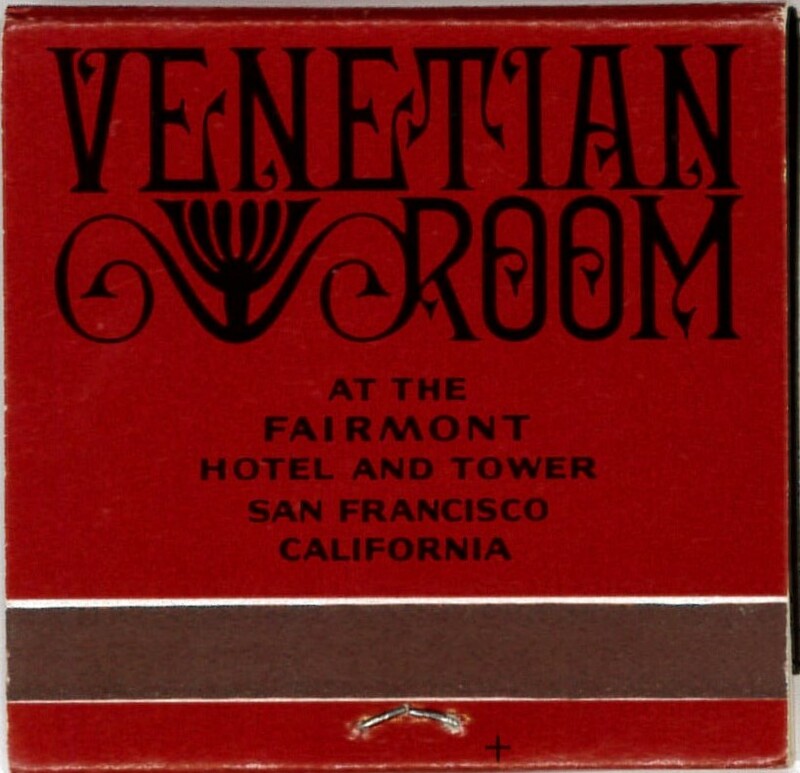 The other highlight of that trip was seeing Ella Fitzgerald perform at the Venetian Room in The Fairmont Hotel. The tickets were $17 each and you got a cocktail with that....and of course free matches--they were everywhere in 1979. 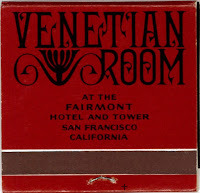 I still have two books of matches from the Venetian Room. Even with the drink and the free matches, I thought I might have to declare personal bankruptcy since the tickets were so expensive. Ella’s a legend, it was a great night. The brush with bankruptcy was worth it. 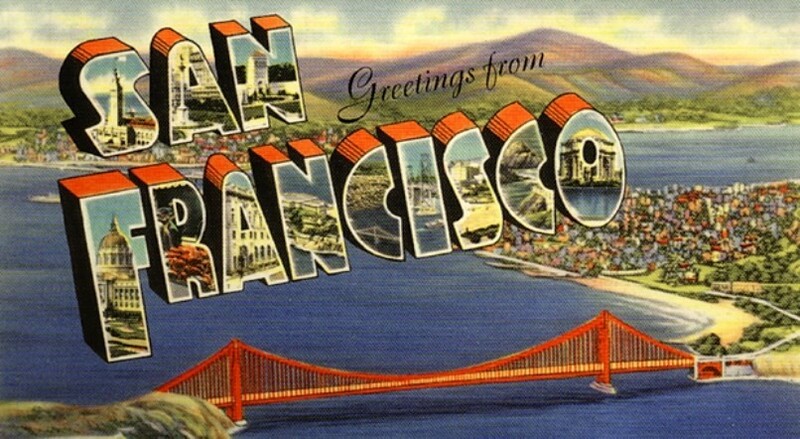 In the between 1979 and today, I’ve been to San Francisco a few more times. For an insurance convention (oh my), for Pride Weekend (oh my times a thousand), and just as a tourist, too. This trip came about for a sad occasion. My friend Zan, the younger daughter of my friends Tracy and Rick, lost her battle with Hodgkins Lymphoma and I was headed west for the memorial service. Zan and her cool husband Todd had just taken me to dinner in August in Oakland at the tail end of my last California adventure. (Things have changed since Gertrude Stein's day, there's plenty of there there now.) It never occurred to me that I would be going back so soon, let alone for such a reason. I flew out as a steerage passenger on Southwest from Philadelphia with another old friend, Rebecca. I was especially grateful for her company, since mourning is not something you should do alone. Bearing in mind the airline's instruction "Literature Only", we passed the time on our flights west by reading Armistead Maupin’s novel Tales of the City on her tablet. I’d read the book a long time ago and hoped it would make an amusing re-introduction to S.F. Written in the post Summer of Love, pre-AIDS, macramé era, its message about the meaning of family seemed especially appropriate for the trip. While we stayed in the East Bay near the site of the memorial service, Rebecca and I arranged our trip so that we had a day The City. As in San Francisco. As so the day after our arrival in California, R. and I drove to the BART stop nearest our hotel. We parked in a nearly deserted garage, figured out the self-service BART ticketing kiosks, and before too long we were headed into The City. BART is similar to the DC Metro without the heroically cool 1970s vintage stations; both systems vintage down-at-the-heels subway cars make the same screeches and squeals. When we got to San Francisco, we got off BART at the first stop, Embarcadero. Upon exiting the station we discovered that it was raining cats and dogs. There was a special kind of weather my mother called San Francisco Fog, something she experienced firsthand when she and my father lived in Berkeley right after World War II. As far as I could tell, the term included everything from a light mist to sheets of rain just this side of Superstorm Sandy. We were in a big San Francisco Fog. We were clueless tourists with no raingear. At my suggestion, we walked down Market Street to the Ferry Building. Since it’s now a hip and chic marketplace filled with food stands, I thought there might be some sort of vendor selling umbrellas next the picture perfect artisanal free-range non-GMO heritage and organic rutabagas. 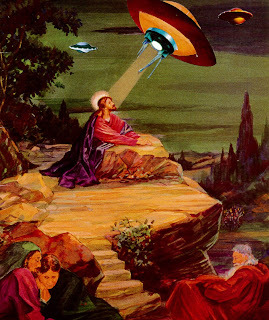 Hey, it could happen, right? The place was a sea of foodies and it immediately dawned on me that fighting the crowd to find the random umbrella seller was not happening. So, I resorted to my standard plan B….Ask a cute guy. There was a wine shop dead ahead. There were no customers and voila, the cashier was cute if tragically millennial. R: Hi. I’m looking for an umbrella. Millennial Cashier: We don’t sell those here. R: Yes, I understand that. To myself I muttered, I may be a rube from Central Pennsylvania but I can tell a wine store from an umbrella store at 30, maybe even 31, paces. R: Well, I thought you might know where I could get one. MC: This is my first day. At which point, his older and less cute coworker came up to the cash register. R: Rephrasing the original question, Hi, I’m looking for a place where I could buy an umbrella. OLCCW: We don’t sell those here. Time to find someone less cute. We gave a once over to a gift-y booth—no umbrellas!—before stopping to ask a helpful looking woman at the chocolatier next door. WC: We don’t sell those here. R: Yes, I know that. Apparently I look stupid enough to try to buy an umbrella at both a wine store and a chocolate shop. Around this point, Rebecca reminded me she’d seen a Walgreen’s near the BART station. It was time to opt for an umbrella made in a Chinese prison instead of something picture perfect artisanal free-range non-GMO heritage and organic from the Ferry Building. We hustled through the San Francisco Fog to Walgreens. We bought two collapsible umbrellas and two maize-colored ponchos, perfect for the Michigan fan on your Christmas list. The bill was $44.00. They might not have been picture perfect artisanal free-range non-GMO heritage and organic but they were certainly priced as if they were. We put on our ponchos and walked outside as we called/hailed/summoned (what is the proper term?) an Uber to take us to Fort Mason and our first destination, the Renegade Craft Fair. In two shakes, our Uber driver called us as we crossed the street in our new raingear. It turned out that she was parked just two doors from Walgreens. We dutifully took them off. We’d worn them all of about 100 feet. I passed on the opportunity to comment to Rebecca that even in the age of Grindr, getting screwed in San Francisco usually involves more foreplay than that, but I sure was thinking it. On the other hand, cranky Uber woman did drive past the outer layers of Fort Mason to deliver us right to the building where the Renegade Craft Fair was taking place. Perhaps she’s just not a 10:45 a.m. person. After our visits to the comfort station, where I witnessed a hipster adjusting his manbun in his native habitat, we were ready to see what was happening and now with 300 “makers”. We entered the drawing for a chance to get annoying promotional emails for the rest of our lives. 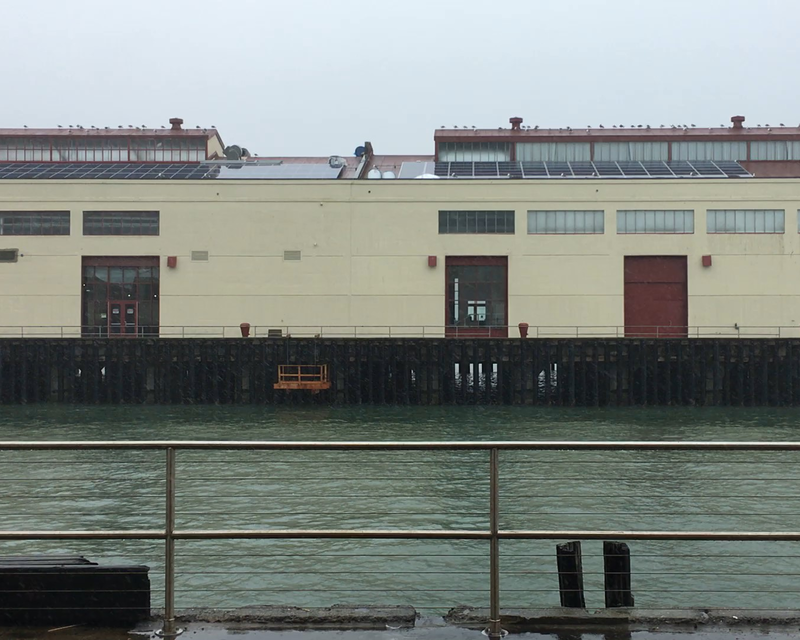 According to the RCF’s press release, we were to be treated to stunning views of the Bay. We missed most of that. And unless he was playing at frequencies that only dogs could hear, we also missed the “live sets by DJREDLite”. Before we even made it to the makers, we stopped at a sponsor booth to sample Health-Ade Kombucha. It’s a probiotic (whatever that is) that promises to build strong bodies twelve ways. No wait. That’s Wonder Bread. Kombucha promises to make you fun faster and jump higher. No wait that’s PF Flyers sneakers. How about it will keep you in skinny jeans, willing to spend $7 on a chocolate bar, your pork pie hat perched at a jaunty yet ironic angle, AND will make you receptive to the idea of anything picture perfect artisanal free-range non-GMO heritage and organic? What’s not to like, right? 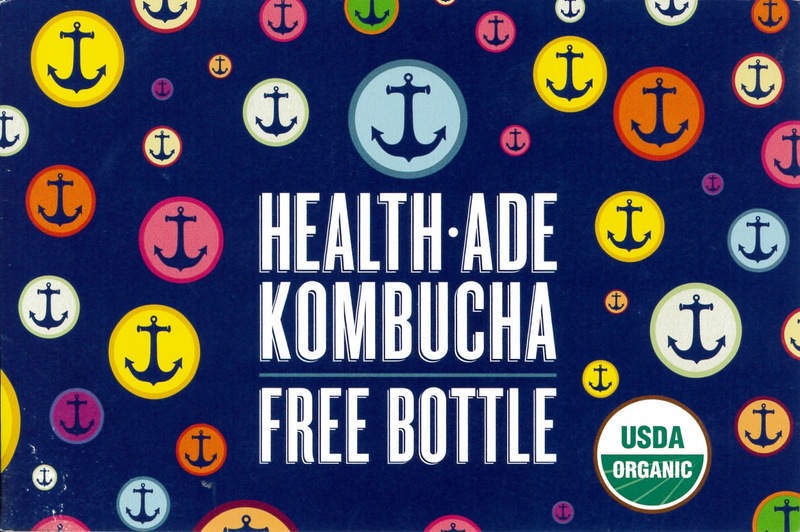 Well, whatever the promises, Health-Ade Kombucha tastes just a bit like something you left in the refrigerator a bit too long, only effervescent. And depending on what you left in the refrigerator that’s a tad off, Kombucha can taste pretty good or just south of meh. I asked the super cute and effervescent—like Health-Ade Kombucha—sampling guy if drinking Kombucha would give me three floating bowel movements a day. He was taken aback: clearly he does not wait on a Bryant every day of the week. But seriously, how can you pass out sample of a probiotic (whatever that is) and not expect people to ask about, well…Number 2? I explained that I’d learned in a sponsor booth at my county fair that the key to good health was to have three floating bowel movements a day. Three. Floating. Bowel movements. Truly. 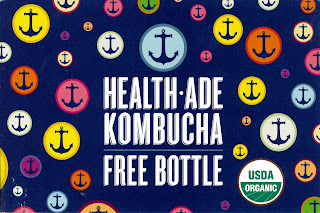 Unimpressed with my lower GI tract worldliness, the Health-Ade Kombucha guy wouldn’t make me any promises about the frequency or buoyancy of my effluvia. However, since I identified myself as a blogger I got a coupon for a free bottle (The coupon expires 12/31, call before midnight tonight!) and a photo too. Then again, perhaps he just thought I was a creeper and wanted to get rid of me. So there were indeed 300 “makers” at the fair. And a few of them had cool stuff. But mostly it was rose to the level of underwhelming. The Japanese crazy paper tube animals were cool, but hardly DIY. I am sure they were made in the giant factory of Amalgamated Japanese Crazy Paper Tube Animals, LLC. No makers were involved in the product. We learned all about a startup called Maven which was a car sharing service like Zipcar but is even better since you don’t have to purchase gas and the cars are picture perfect artisanal free-range non-GMO heritage and organic. (Just kidding!) Even though neither R nor I lived anywhere near where Maven was available—it seemed as if it covered only a few neighborhoods in San Francisco--we listened politely to the booth babe (a term I mean in a non-sexist gender-neutral yet still objectifying way) since he was cute and had a cool black Maven logo tee shirt. And since we were there early in the day, we figured he needed to practice his spiel. We did all 300 booths and that gave me more than my fill of the maker/DIY scene. We met an artist with great greeting cards but as far as stuff that I would buy with my own money, that was about it. So that “emerging female-owned-and-operated creative studio producing a wide spectrum of useable objects including home goods, lighting, and wearables”….? Um, me not so much. And the “artful notebooks and paper goods for the curious, creative, and bold”? I gave at the office thanks. As for the “high quality, organic, chemical-free” skin care products? I prefer a daily chemical peel with low end crap I buy at Sam’s Club. Most of the stuff wouldn’t have made it past the jurors for the Central Pennsylvania Festival of the Arts. The stuff was nice enough, but the jewelry, especially, bordered on the rudimentary. It seemed as if it were OK to stop thinking once you had your first idea. The audience was young and overwhelmingly straight. For yet another episode in my life, I was an outlier. A minimalist booth is de rigeur, especially if it comes from the minimalist maker/DIY craft show booth section of IKEA. In a pinch, makers make do with chicken wire as an intentionally ironic substitute. Square business cards, from MOO, are where it’s at. Rebecca filled me in on this. Makers are onto something here. They are cool. Wherever possible, signs should use the Roz Chast hand lettering font. Cacti and succulents are back. We saw 7 booths of cacti and succulents. This means that spider plants are the NEXT BIG THING. People not only buy macramé, they wear it. Seriously. Macramé jewelry is a thing. I don’t know that Martha Stewart would call it a good thing, but it’s definitely a thing. Not everything was made by hand—but if you are young and cute enough and wear monochromatic and somewhat asymmetrical clothes that look as if you bought them at an art festival—you can count as a “maker” too. With our fill of maker-ness, we called/summoned/hailed another Uber and waited in the San Francisco Fog for our ride to materialize. I passed on a $4 cup of food truck Joe and the rest of the “exciting lineup of local food and drink options” while I was waiting. As any hipster can tell you, it’s hard to fit into skinny jeans if you eat actual food. Favorite line: "clearly he does not wait on a Bryant every day of the week." You do know what we're like, Katherine!